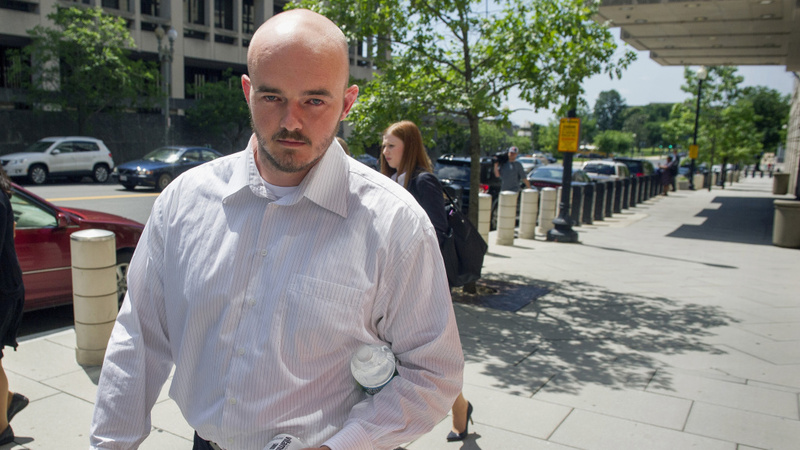 Former Blackwater Worldwide guard Nicholas Slatten leaves federal court in Washington, D.C., in June 2014. Slatten was found guilty for his role in a deadly Baghdad shooting, but his conviction was overturned. On Wednesday, his retrial ended with a hung jury. The future of the case is unclear; attorneys for both sides will be meeting next Friday to discuss the options, including the possibility of a third trial. Bill Miller, a spokesman for the U.S. Attorney's Office in Washington, D.C., told NPR via email that the office "is reviewing the matter and has no further comment at this time." Blackwater USA, a now-notorious private security contractor, was hired by the U.S. State Department to protect diplomats during the Iraq War. In September 2007, Blackwater guards opened fire on Baghdad's Nisour Square, killing and injuring unarmed civilians. Slatten was one of four guards who were found guilty in connection to that shooting. They were first charged in 2008, but that case was thrown out. The case was revived in 2013, and the next year, the men were convicted after marathon jury deliberations. Slatten was convicted of first-degree murder and sentenced to life in prison, while the three other guards were convicted of manslaughter and attempted manslaughter. But last year, a three-judge panel of the U.S. Court of Appeals for the District of Columbia Circuit threw out Slatten's conviction and said he should get a new trial. "The judges said that Slatten, who was the only defendant charged with murder, should have been tried separately and that a new trial would allow him to introduce evidence that he wasn't the first to open fire. "Separately, the judges also ordered the resentencing of Slatten's former Blackwater colleagues Paul Slough, Dustin Heard and Evan Liberty, who had each been serving 30 years on manslaughter and weapons charges. In a split ruling, the judges found the length of those sentences constituted "cruel and unusual punishment." The resentencing of the other three Blackwater guards had been postponed until after Slatten's case was resolved. Blackwater, which was founded by Education Secretary Betsy DeVos' brother Erik Prince, was sold after its name became synonymous with military atrocities and misconduct in Iraq. Initially renamed Xe Services, the company is now called Academi.